Yesterday I took a 25 km drive north of Bintulu town to the bustling industrial heartland of Kidurong, a satellite town of Bintulu. At the very end of the Kidurong highway was this unique building. It's not that the Titanichas landed on Bintulu's shores. 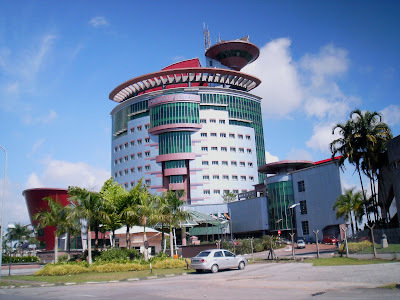 Rather it an ultra-modern building belonging to the Bintulu Port Authority, a Federal agency under the Minister of Transport that was set up about 30 years ago to develop the port infrastructures at Kidurong for the export of liquified natural gas. Thus it took a slow momentum to fully develop Kidurong into one of the most successful petro-chemical zone in Malaysia it is today. Within Sarawak soil there's nothing to beat it. Bintulu Port has been a major player in the gradual build-up of the immediate industrial heartland and also the outlying far reaches of Bintulu's rural hinterland. 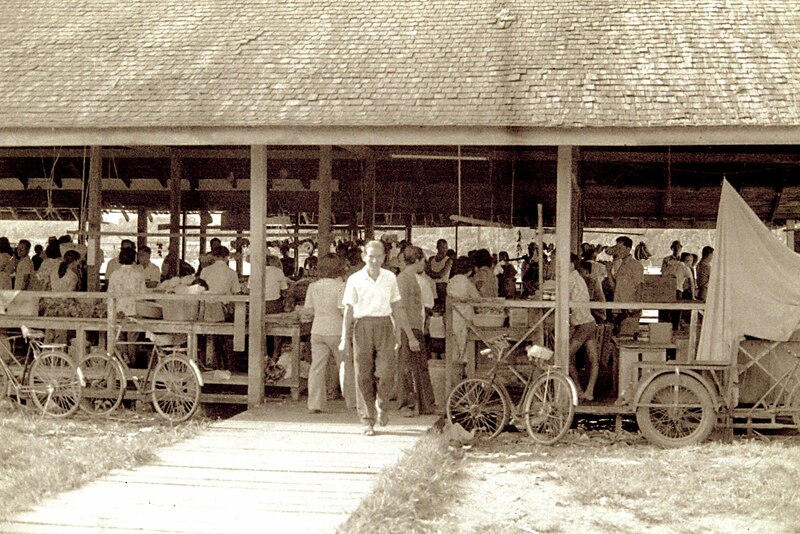 Bintulu is naturally endowed with vast exploitable forests, minerals, deep sea, beaches and rivers. From these resources a very robust, diversified and profitable economic superstructure has been developed over the last 30 years that transformed it from a sleepy hollow to an industrial showpiece presently. Being a Bintuluian, I am witness to its evolution and at different times a participant to its progress, physical or otherwise. To me 30 years is just like yesterday when there was not even a road link from Bintulu town to Kidurong. But many more things can happen here because Bintulu seems never to sleep from the long slumber it was subjected to before the opening up of Kidurong. 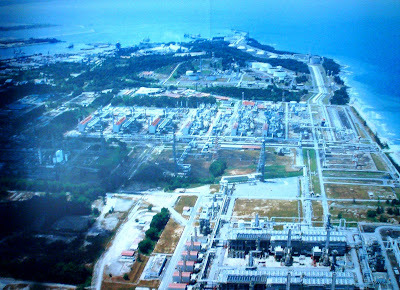 Kidurong Heavy Industrial zone, showing LNG complex -biggest in the world in a single location. Outside the gazetted Bintulu Port area is a rim of heavy industrial undertakings. From the foreground to the back of the picture is the largest installation of liquified natural gas(LNG) in one locality in the world which is constituted of three huge LNG plants and 6 storage tanks,maze of pipelines and process buildings and tall flares that can be seen from as far as 30 kilometers at night. The inset below shows 6 huge tanks that store the LNG temporarily before they are piped to waiting LNG ships that berth at the Bintulu Port's three LNG jetties. Bintulu Port grew rich due to income from the LNG export terminals where it provides berthing, stevedoring and towage facilities to the many LNG ships. Don't be surprised that the jetty terminals can load two LNG ships per day with each loading taking an average of 12 hours. This being the current trend. Since is operation, the LNG cargoes form close to 60% of the total tonnage handled yearly. But Bintulu Port is more than LNG export terminals. 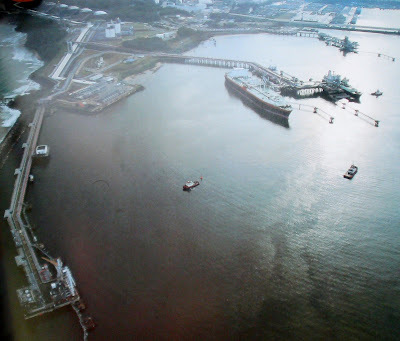 With the further utilisation of oil and gas resources Bintulu became the centre of crude oil storage and exporting point, the off shore gas that has been processed by Sarawak SHELL are piped to other industrial users. Principally among them are the Asean Bintulu Fertiliser Plant ( that use it to manufacture urea, granular fertiliser etc.,) Sarawak SHELL MDS( Middle Distillate Synthesis) Plant - that process the gas synthetically to manufature downstream products like paraffin wax, diesel fuel, kerosene, aviation fuel etc., using gas-to-liquid(GTL) technology, Petronas Gas Berhad ( that process and bottle the gas for domestic and industrial consumption as burning fuel) and many other smaller refining facilites that uses the natural gas for heating ( e.g. oil palm boilers for the production of cooking oil) and Sarawak Electricity Corporation ( that uses the gas for generating electricity by gas turbines) . The three LNG jetties that are owned by the Bintulu Port, providing berthing and towage facilities to LNG ships before leaving the port to Taiwan, Tokyo and Korea. To me there's no stopping the role that Bintulu Port will play in the future growth and development of Bintulu. Besides the petro-chemical industries Bintulu Port also handle bulk cargo and containerisation. The list of bulk cargoes it handles are : crude oil, crude palm oil, plywood, timber mouldings, sawn timber, veneer, medium density fibreboards, raw silica sand for export and a whole list of consumer goods both for export and import. The internationalisation of trade it promotes has currently made Bintulu into a well-known destination for cruise ships that bring visitors from far away destinations like Singapore, Hong Kong and many more other places in future. The future of Bintulu Port lies very much in the forward thinking of its major shareholders as well as its other stake holders to stimulate and step up the further utilisation and operational infrastructures it can offer.